It appears that morels are gaining more popularity every year, or it could be that I live on the West Coast and am around them more often. My brother in Vermont has spent years seeking the elusive morel, while my husband grew up picking morels by the bagful in Washington. Since I’ve moved to the West, we try to visit my in-laws every morel season, which lasts only a few weeks every spring (once the snow recedes). Morels tend to like disturbed ground such as previous fires or logging. I’ve seen them growing near evergreens, mostly pine and Douglas fir. They are also found in moist woodlands and along river bottoms. It’s funny they grow near pines, because they sort of look like pine cones which makes finding them a little difficult to spot. It’s not a giant puffball in a meadow or a bright orange lobster in a sea of brown duff, it’s totally camouflaged, adding to the challenge of the “hunt” and the enjoyment of the reward. Morels are pretty easy to identify and luckily don’t have any deadly lookalikes, except the false morel. The false morel is more brainy looking and the bottom edge of the cap hangs like a skirt, where the true morel wears leggings. 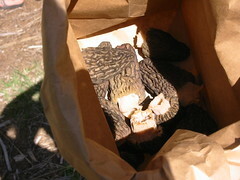 The real challenge is not the i.d., but rather finding morels before the bugs get to them. They become bug hotels if you don’t find them soon enough. Morels aren’t usually dirty, so cleaning them is easy if they aren’t buggy. I like to slice the larger ones in half and throw them all into a bowl of salt water to let the bugs escape. If I’m not eating them right away, I store them in a container with a damp towel on top to retain moisture. You can easily dry them out in a dehydrator if you want to wait until winter to put in a creamy soup. I usually can’t wait that long and fry them all up. Do you want to feel good about eating morels? They are low in calories, carbs, sodium and are fat free. They contain vitamins B, D and are a source of protein. If there’s a little dirt on it, you’re probably getting your B 12 as well. Traditionally, morels have been consumed to prevent cancer, improve eyesight, hearing and circulation. So fry them up in a little Earth Balance and garlic and chow down. They are also amazing in omelettes, so I’m looking forward to next spring to try them with FatFreeVegan’s omelette recipe.